This simple flower arrangement features Yellow Asiatic Lilies arranged an a clear vase with simple greens and a pretty wired ribbon accent. 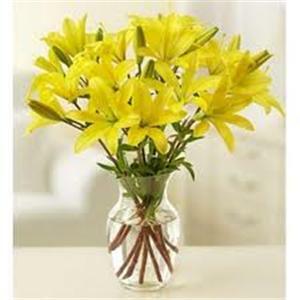 Choose Four Seasons Flowers for beautiful, yellow lily arrangements for any occasion! Yellow Asiatic lilies arranged in a vase with simple greens.